If anyone is growing any of these I'd appreciate Do you have any information about Correas? Leave a message on the Contact page. ​Correa glabra var glabra Wingabutta Ck grows on both sides of the road at Wingabutta Ck crossing on the road to Coonabarabaran. I had collected this species years ago on the reserve side of the road but those plants are looking very sad. The population is almost depleted. Luckily there is a very healthy population on the other side of the road. ​I collected Correa Bilby Blush at Bilby Blooms nursery (Binnaway) last year when I did the Pilliga Tag along tour. It appears to be a C. glabra var turnbullii hybrid but more will be known about it later. The C. reflexa var nummulariifolia plants from Flinders Island are now flowering. As you can see by the photo above they bear no resemblance to the Correa which comes from the SW coast of Victoria and is marketed as nummulariifolia. These flowers are closer in form to C. glabra varieites. C. reflexa var nummulariifolia is restricted to the Flinders Island group of islands. They grow as low spreading shrubs on rocky ledges or in dunes near the beach. I have now planted a few from different Flinders Is. locations in full sun in the garden and so far they seem to be doing well. Have now photographed Correa Marian's Baby, a seedling from the Handscome garden at Pomonal in Victoria. It came up near a C. 'Marian's Marvel' hence the name. It appears to be a C. pulchella hybrid judging by the leaves and floral tube. The flowers are mid pink fading to paler pink with a very pale pink under the tips which are curled back. It looks like a very nice plant and is currently being trialled in my garden. How time flies. It's been 9 months since I added to this site and I do apologise to readers. Last August I travelled to the Grampians and collected a few specimens for the second time. Over the years I lost these species and was keen to get them going again. From the Grampians I headed south to the coast revisiting earlier collection sites. There were a couple of surprises. The Correa reflexa var reflexa which had been called Granny's Grave doesn't grow at the graveside. It grows along the track and should be called Grannys Grave Track. I found a specimen of Correa backhouseana growing on the dune in the Warrnambool area. It was hard to know if this was a remnant or if it had grown from a seed deposited by a bird. There are no records for this species growing this far west. There are a few occurrences in the Colac-Otway area. The cuttings I collected in January 2016 from Bob O'Neill's garden are now being planted out. I am including photos of three of them above - Peg named by Bob after Peg McAlister, Pinker Bells which has been floating around for a while and Auntie Kay also named by Bob. If anyone is growing any of these I'd appreciate some more information. Bruce McGinness sent a query about an unusual Correa growing in the Berwick Botanic Gardens. I have included photos above. The species is the rare Correa calycina var halmaturorum which grows naturally along the De Mole River on Kangaroo Island. It is a very hardy species in the garden and appears to do well in a well-drained dry position. I had a plant years ago which grew to about 1m in height but sprawled in a fairly untidy manner. It would respond quite well to pruning. My new Correa Ice Princess has flowered. See photo above. It appears to be different to others in that it has a square calyx which indicates a C. glabra association. It's possibly a cross between C. glabra var turnbullii and C. alba. It is different to Correa Ice Pink which has a shorter more flared bell and the pink is more salmony pink. Another mystery solved. Spent the morning potting on struck cuttings, many from Bob O'Neill's C. pulchella collection. I called in on Bob on the way back from Flinders Island and raided his garden for cutting material. Am quite excited about planting these out eventually. C. pulchella are tricky in the garden. They like a fairly cool environment in semi-shade on well-drained soil with some sun during the day. They are not as drought hardy as other Correas and do benefit from regular watering and a handful of Dynamic Lifter in Autumn and Spring. Over the weekend I collected the Sydney form of Correa reflexa (red) from the Port Hacking area. This is an important addition to the collection. Lorraine and Brian Weir sent cuttings of a new Correa (could be an old one with a new name). Correa Lime Twist (Label: Narkabundah Nursery) is a prostrate C. reflexa with fat lime coloured flowers and dark green foliage. The label says that it is long flowering, suited to average moist but free draining soils in sun or semi-shade. Drought hardy once established. Can be grown under eucalypts or acacias and is ideal for coastal gardens. Does anyone have cutting material of 'Lemon Twist'. Have just lost it in the garden. We are having our third year of drought and with the high temperatures over the past month, it's been very hard trying to keep the water up to my garden. The strange correa which I found on Flinders Island doesn't seem to fit any of the categories. The cuttings I collected have now struck and I'm impatient to see what the flower looks like so we can make a proper ID. Anthony O'Halloran gave me a tube of his new seedling which he called 'White Lies' (see photo). It arose on his property 'Bilby Blooms' at Binnaway near Coonabarabaran. It appears to be a C. glabra x pulchella hybrid with a clear white flower. Anthony described it as a prostrate plant hence the name 'white' and 'lies'. Have taken cuttings which are starting to strike and will be planting this one out very soon. Collected cuttings of Correa Ivory Beacon yesterday (see photo). This appears to be a hybrid between Correa glabra var glabra and Correa pulchella. It is a very vigorous plant with lovely long creamy coloured bells which stand out from the foliage. It is listed by Bushland Flora as being 0.5 - 1.5m tall with a width of up to 2m. It flowers from Autumn to Winter. Had a call to say that Ice Princess may be the same as Ice Pink. Will have to wait until they flower to compare them. Visited Flinders Island in Bass Strait during January checking out the correas. Correa reflexa var nummulariifolia was split off several years ago and has now been confined to the Bass Strait islands. The Victorian form being sold under that name is really C. reflexa var reflexa. I know, I know! It doesn't make much sense especially as the Flinders form is nothing like the Vic form. In fact it looks more like C. reflexa var scabridula. Along with C. alba we also found what could be a new species. The leaves looked and smelt like Correa glabra. They were growing side by side with C. alba in two locations on opposite sides of the island. Will be able to tell you more later. Above are some photos. Planted out a couple of Correas called 'Ice Princess'. Can't seem to find any information on this variety apart from the fact that it may have originated in the Goldfields revegetation Nursery. Can anyone help with this one. It hasn't flowered yet so I can't work out what kind of a hybrid it is. I am looking for cutting material of C. reflexa var angustifolia. Leaves are narrow and flowers are at least 4cm long. Can anyone help out? I have a form which appears to be a natural hybrid between C. reflexa var. angustifolia and C. reflexa var. scabridula. It is being marketed as the Grampians form. It is quite stunning - covered in flowers for a long time. The leaves are narrow and dark green, rough to the touch on top and velvety light green underneath. The margins are wavy and slightly rolled under. There is a definite mid-vein. Length 28mm Width 8mm. Flowers are short and trumpet shaped, widening out towards the tips which are pale green and slightly curved back. Anthers just poke out of the floral tube. The floral tube is a rusty red pinched in at the calyx which has four small teeth. Attended the Canberra ANPSA conference last week and came home with some cutting material of a few new forms to add to the collection including the pale pink and cream C. reflexa from Abercrombie Caves. On the way back I stopped off to collect Correa glabra growing on the roadside near Wingabutta Creek and called in to Bilby Blooms at Binnaway. Anthony gave me a plant of his new white seedling which he has named 'White Lies' because of the way the stems lie on the ground. Henry Anthony's cutting material of 'Henry's Burgundy' arrived while I was away. Very exciting! Went to Battery Hill near Urbanville to document the rare Phebalium speciosum last weekend. While there I collected cutting material of a Correa reflexa with hairy leaves which looks like it could be a green form but I won't know till it flowers. C. reflexa does occur just north of the Queensland border according to records but I haven't seen it in the wild. It is listed at Girraween NP and possibly also occurs in the bush around Stanthorpe. Came across a few 'new' Correas being marketed by Greenlife Ozbreed. Would love to hear your comments. Description: Bellissimo™ Correa is a low, spreading, compact plant with large pink and yellow bells. Size: 50cm high x 1m wide (smaller with pruning). Uses: Pot plants, small garden landscapes and mass planting; honey eating birds are highly attracted to this plant. Position: Full sun to light shade. Prefers reasonably drained soil, however it is adaptable to most soil types. Tolerates drought and frost. 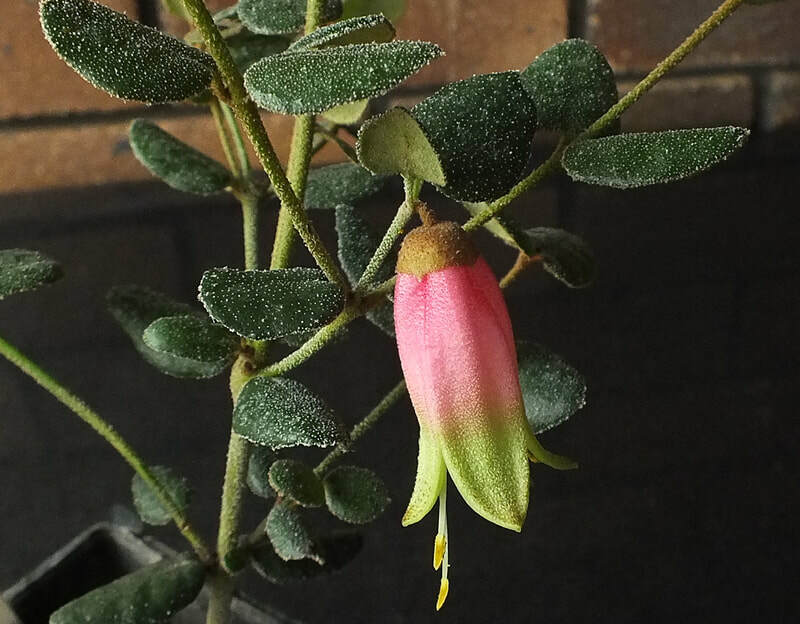 Description: The Coastal Pink™ plant has a more noticeable tinge of pink to its flowers in comparison to other Correa alba forms. It has a strong growth habit that landscapers will love, along with its ability to work in coastal situations. Size: 2m high x 2m wide (smaller with pruning). Uses: Coastal bird attracting landscape filler between trees, mass planted as a medium sized shrub or as a small to fence sized hedge. is adaptable to most soil types. Tolerates drought and frost. Description: Crimson Tide™ Correa is a strong growing ground cover with clean green foliage and masses of vivid flowers. It also has a denser appearance. Size: 50cm high x 2m wide (smaller with pruning). Uses: Bird attracting ground cover plant for residential and commercial mass planting, or as a specimen plant in smaller gardens. Compact, dense Correa pulchella ground coverDescription: Fire Bells™ Correa is a compact ground cover with intense orange/red flowers. It needs very little pruning to stay compact, making it perfect for containers and small gardens. The Fire Bells™ plant has low water requirements once established. Size: 25cm high x 80cm wide (smaller with pruning). Uses: For bird attracting gardens, dense ground cover for small gardens, or containers for patios. Description: Trixibelle™ Correa is a vigorous growing ground cover that is highly suited to landscapes due to its weed suppressing capabilties. It is a fast growing, low spreading form for the southern states of Australia. Uses: Good as a mass planting ground cover on large commercial developments and as a winter flowering feature plant for gardens. Had a visit during the week from Henry Antony and his wife of the Portland area in Victoria. When I first took over the Correa SG leadership in 1992, Cherree Densley introduced me to Henry and his interesting C. reflexa form which she named 'Henry's Burgundy'. I wasn't successful in getting it to grow and for years we thought that it was lost. Henry was able to tell me that he still has it growing and he is now trying to spread it a bit more widely. He has promised cutting material which is very exciting. He has also given cutting material to a local nursery. I'm always staggered at how old forms seem to reappear thanks to someone's garden. It's a great case for conservation through cultivation. Have been potting on a large number of Correa cuttings lately. In Autumn I went through the whole collection and put in 3-5 cuttings of each variety. I don't have bottom heat but I do have a misting system with a sensor. It's very strange but cuttings put in in September will strike in October. Cuttings put in in Autumn will just sit there then put down roots in September/October. We are having a very cold September this year so that is probably slowing things a bit. I use small peat plugs and put an individual cutting in each. When roots appear you just plant the whole plug. That way you don't disturb the roots when transplanting. It's also easy to see when the cutting has struck as the roots appear at the bottom or side of the plug. I use Clonex red for Correas. I find it more successful than Clonex purple. Bill McEwan of Bendigo - a real Correa enthusiast - rang to say he has a small plant of C. 'Desert Glow' which he is nursing along and hopes to take cuttings later in the season when it has fresh growth. Goldfields Revegetation Nursery have a few plants in their gardens and he has asked them to propagate the variety so that they can be spread around again. The Little Desert forms of ﻿Correa reflexa var scabridula﻿ seem to be somewhat unreliable in cultivation and work needs to be done on selecting the strongest plants for propagation. Bill also suggested that some of the Mallee labelled plants may have other names. He thinks that Correa 'Mallee Pastel' could be the same plant as C. 'Ice Pink', C. 'Mallee Lantern' is the same as C. reflexa var speciosa 'Marilyn's Favourite' or C. reflexa 'Fat Fred', C. 'Mallee Pink' looks remarkably similar to C. 'Candy Pink' and C. 'Mallee Fire' is the same as C. 'Autumn Blaze'. It also seems that C. 'Red Empress' is being marketed as C. reflexa - large flowered form with a special label. The giveaway is the note on the back of the label saying it is a suckering form. This is the only suckering form of C. reflexa that we know about. He recommended a few more Correas which people might be interested in. C. 'Di's red/yellow' - originated in Dianne Gillies garden - flowers for a long time from Autumn to Spring - has dark green foliage - is 70cm tall - flowers are a vibrant vibrant colour - flowers are similar to Canberra bells but narrower. C. 'Diane's Lemon' - similar to C. 'Lemon Twist' but has greyish green foliage. It is a compact plant growing to 50 - 70 cm - it might be a C. reflexa var nummulariifolia form from SW Victoria or a hybrid of that species. C. 'Karawatha Bells' - that name has now been done away with and it is being marketed as C. pulchella 'Coffin Bay pink'. It may be the same plant as C. 'Dot's Delight'/'Dot's Dream'. Bushland Flora is selling it as C. 'Fuschia Bells'. Correa reflexa 'Jetty Red' is a new introduction on the Bushland Flora list. It's a delightful plant growing to 70 cm tall. Correa 'Little Pink Belle' (C. decumbens x 'Federation Belle') being sold by Tarrawood Nursery in Bega is another new introduction. and they have listed Correa Mallee Pastel, Correa Mallee Lantern, Correa Mallee Pink, Correa Mallee Pixie, Correa Mallee Bells and Correa Mallee Fire. Some of these I suspect are new names for plants which are already named. Correa Mallee Bells looks like Di's Favourite. It's very hard to tell the others from the labels as the colour may not be true. If you are growing any of these I would love some cutting material to do a comparison. There's no law against re-naming a plant to make it more marketable but it's a question of ethics in my opinion. The nursery is located in the Yarra Valley region of Victoria not that far from Melbourne. As well as Correas they have Grevilleas, Eremophilas and many other species listed under the Mallee label. Roger Wileman sent some more Correa cuttings. Thank you Roger. Have posted a photo above which he sent of a typical Brisbane Ranges form. Put in some cuttings of the Port Campbell form of Correa reflexa var reflexa sent by Roger Wileman. Two forms were sent. The first has a short fat cream bell with tan anthers and the second has a longer narrower bell with tan anthers. The typical coastal form of Correa reflexa from Western Victoria has a short fat cream bell with dark brown anthers. The leaves are similar on all forms and it will be interesting to see if the habit of the plant varies. Most of the western Victorian forms are dense prostrate shrubs spreading to over a metre in width. I noticed that the foliage of these Port Campbell forms has an unusual fragrance when crushed. I gave a presentation on Correas to the Keilor Plains Group in Melbourne last Friday night. it was a most successful event with 70 people in attendance, twice as many as usually go to their meetings. Victorians have had a love affair with Correas for many years and they are always looking for new varieties to fill spaces in the garden. Thank you to the members, Anne, Ros, Ginny and Chris who made my stay such a pleasant one. On Saturday we visited the new Melton Botanic Gardens. Many of the WA Mallee gums were in bloom - sensational. This is an amazing project - mostly done by volunteers. If you haven't seen it you need to make the effort. From there we visited the Pye garden. David and Barbara have been long standing members of the Correa SG and were administrators of the group for several years after I stood down as Leader. Their garden has a huge collection of Correas and they have quite a number of seedlings. Finally we visited Neil's small but exquisite suburban garden which features some very interesting Correas. Neil also propagates many varieties and brings them to meetings. 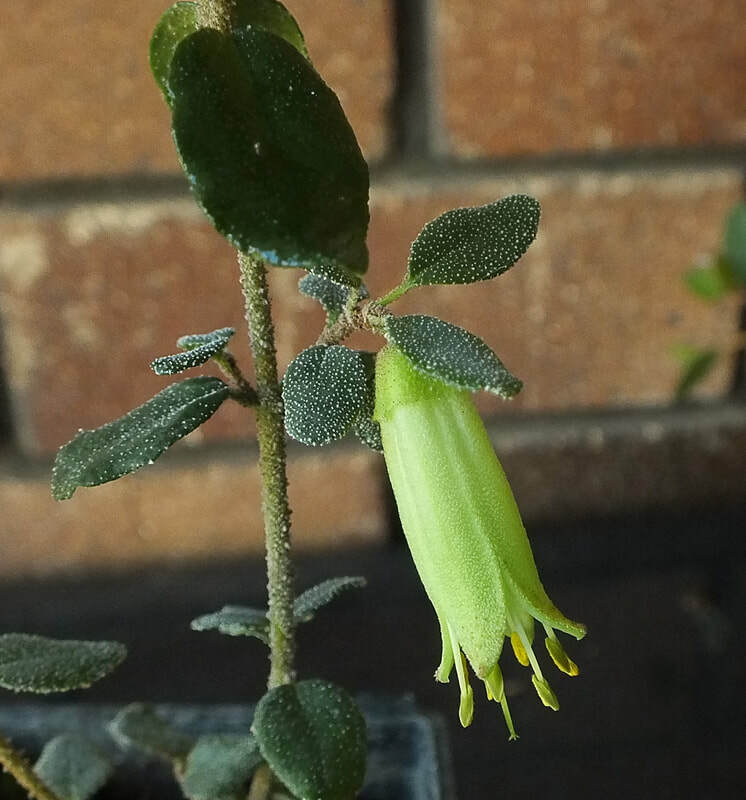 Very excited today to see flowers on my Correa lawrenceana var lawrenceana narrow leaf form. I bought it from Plants of Tasmania and planted it out in 2013. Had to keep the water up to it during the drought last year but it is thriving. I lost the large leaf form which may have originated from a rainforest location. I remember seeing the most wonderful specimen growing in a park in Latrobe, Tasmania. It was a small neat tree absolutely dripping with golden bells. Conditions were right today (partly cloudy) for photographing in the garden. Have added more varieties to the gallery page. Today I added another four photos to the gallery. Correa alba Millers Landing was sent to me by Bob O'Neill some time ago. Correa alba Stanley I collected on our trip around Tasmania in 1999. Correa backhouseana var orbicularis Half n Half was one of Marian Beek's garden plants. It's a very tough Correa with lovely brightly coloured bells that originates on kangaroo island and looks very much like the Seal Bay form. Correa backhouseana x Rocky Cape was sent to me a long time ago and the origin is unknown. Rocky Cape is on the north-eastern coast of Tasmania but the flower looks greener than the normal C. backhouseana. It looks like it could be hybridised with C. reflexa but there are no wild forms in that area. Perhaps it originated as a garden seedling. Bunnings are selling two Correas under the Mallee name. C. Mallee Bells should be marketed as Correa Di's Favourite and C. Mallee Pink is Correa 'Candy Pink'. It's very confusing when nurseries add their own names to varieties which are already being marketed under a different name. The rule is that the first published name is the correct one. Correa 'Candy Pink' was registered with ACRA in 1988 but was known under that name for many years beforehand. It is believed to have been one of Jim Hartshorne's induced hybrids in the 1970s. It has been marketed as C. 'Pinkie', C. 'Powder Bells', C. 'Pink Pixie' and C. 'Mallee Bells'. C. 'Di's Favourite' was published under that name in 2010. It is not yet registered. Correa pulchella 'Hayley' is now flowering. it is one of those vibrant orange C. pulchella forms that you see on the Eyre Peninsula and on Kangaroo Island. I have had it growing in the garden for several months and although it was slow to start, it is now starting to develop new branches. It is a prostrate spreading plant growing up to 0.2m in height. It would be great in the foreground or in the shelter of a larger shrub. Correa pulchella 'Hayley' (one of Bob O'Neill's new namings) has swollen buds and should be flowering in full sometime towards the end of this week. Nearby Correa 'Country Belle' (formerly New Year) has a single large bright red bell. While I had the camera out I also photographed Margaret Guenzel's 'Bush Pearl', an alba hybrid that originated in her Geelong garden - Margaret means Pearl so it is named after her in an indirect way. Got an email from Neil Marriott this morning. His C. reflexa var scabridula hybrid now has a name: C. 'Banrock Pearl' named after the property where it originated. I had asked him if he still has that wonderful white C. pulchella with long trailing stems and he does. This is a very long-lived plant as I remember seeing it about 20 years ago. Neil told me that his area is now regularly receiving half the annual average rainfall that it used to receive - the C. pulchella and C. glabra varieties are doing well in the drier conditions. I spent Monday visiting the Bruderhof community at Inverell. The property is called Danthonia and they are a religious commune similar to the Amish. They come from New York State but originated in pre-war Germany. They are passionate about growing Australian Native Plants in particular Wattles and Correas. The children have sections of the gardens which they are responsible for. They not only grow the plants but research them as well. I found it very refreshing to be amongst old-fashioned children who have such a strong interest in nature. While there they showed me a C. alba x backhouseana. I took cuttings and tentatively called it Danthonia until I can do a comparison of leaf and flower structures. I put the last of Bob O'Neill's cuttings in this morning - had to wait for a new box of jiffy plugs as I'd run out. I also photographed the unusual large hairy leaf of C. reflexa 'Running Creek red', C. pulchella Norma B, C. reflexa 'Lemon Twist' (looks like one of those Portland forms) and C. reflexa var scabridula 'Carpenter Rocks'. I shall compare this with 'Squat' and see if they match. Bob O'Neill sent me a new batch of cuttings today. I have now put them in and updated the records. Have to wait until they strike and flower for photos although I managed to get three varieties. New C. pulchella varieties not previously published are: David's Orange, Dot's Dream, Blondie, Old Pink, Big Al, Max, Debbie, Little Kerry, Streaky Bay and Rose Red. Was particularly happy to get replacement cuttings for Maja's Miracle and Alby Lindner, both of which I lost recently. Bob also sent a red form of C. reflexa var reflexa 'Running River' from the headwaters of the Snowy River. The green form had been previously recorded as C. 'Running River Green'. The white form looks very promising. I hope all the cuttings strike. I have a misting system but no bottom heat. It usually takes a bit longer for cuttings to strike at this time of the year. Went to the Australian Plants Society meeting last night and came hope with cutting material of a few varieties missing from the collection. I have been after Correa lawrenceana var cordifolia for some time now. Thankfully one of the members has it growing in the garden. Another member had a new variety I'd not seen before called C. 'Ivory Beacon'. It looks like a C. glabra x with a large almost white bell. Quite exciting. Another find was a bright yellow hybrid which appears to be a cross between C. backhouseana and C. glabra. I've called it 'Yellow Bells' for the moment. Correa reflexa var scabridula normally has small trumpet shaped red bells. The form above has larger longer bells which indicates hybridisation with something else. I'll leave it unnamed for now. I have cuttings in and will have to compare it with other C. scabridula forms at a later date. Another wet day. Fantastic. Bob O'Neill emailed me today with his choice of name for the hybrid which we have been calling O'Neill 2. I gave him a range of options and he selected 'Peachy Bob'. This is an excellent plant which I have had in the garden for several years. It has an upright form growing to about 0.5m x 0.4m with pointed leaves and medium sized peachy pink bells. Brendan Stahl emailed today with a request for the Correas List of Cultivars which I produced a few years ago. Have decided to update it and add it to the website. It has a list of all the published names. There may be some additions required but it will do for a good start. Click on the Cultivars page. It's a wet day with intermittent showers. Quite a change after the dry and warm few weeks we've been experiencing lately. It would be nice to say that the 2 year drought is over but the weather bureau is predicting an El Nino for later this year. Another dry spring coming up. Sigh! Over the past few days I've been photographing the living collection and adding photos to the gallery. I did another 14 varieties today and have about 40 left but I have to wait until they flower. In the process I've made a couple of discoveries. The first one is an unusual C. decumbens hybrid - quite different to 'Karwarra' and 'Pink Panther'. It has fat bright red bells with yellow tips. I've tentatively called it Correa 'Red Devil'. The plant is a dense groundcover about 0.2m high x 1.5m wide. It is frost and drought hardy and I think it has real horticultural potential. The second find was a plant I thought I had lost - 'Lime Splice' sent by Jan Simpson a few years ago. It has a narrow lime coloured bell which is darker at the tips. I'm not sure about the habit of this one as I'd planted it in the shade and it was quite straggly. I shall have to plant it in a full sun position to see what it does out in the open. Needless to say I took cuttings of both plants and hope to spread them around.